Tinsel often collaborates with childhood friend Twinkle Troughton, sharing a history and similar creative concerns, they frequently join forces to work on projects and exhibit together. Below are some of the art stunts they have created together in recent years. Tinsel and Twinkle dressed as traffic wardens and took to the streets to dish out parking fines across London. But instead of a fine, inside the official parking ticket bag was a free artwork: a limited edition screen print. In response to the global economic crisis, Tinsel and Twinkle decided to kidnap a banker. They held him to ransom for the duration of their opening night of their duo 'mini-retrospective' exhibition in 2012. Tinsel & Twinkle created their own bank, which trades in thought rather than currency. They made their own uniforms, branding and bank notes, set up the bank and asked people to write their thoughts about money and the economy onto the bank notes, in exchange each person was given another T&T banknote with a thought or quote written on it. The Bank of Tinsel & Twinkle actively promotes the idea of sharing. The Bank of Tinsel & Twinkle was active throughout 2013, they set up in several locations in London, and following this in Central Vienna (to coincide with their duo exhibition at Galerie Michaela Stock that year). 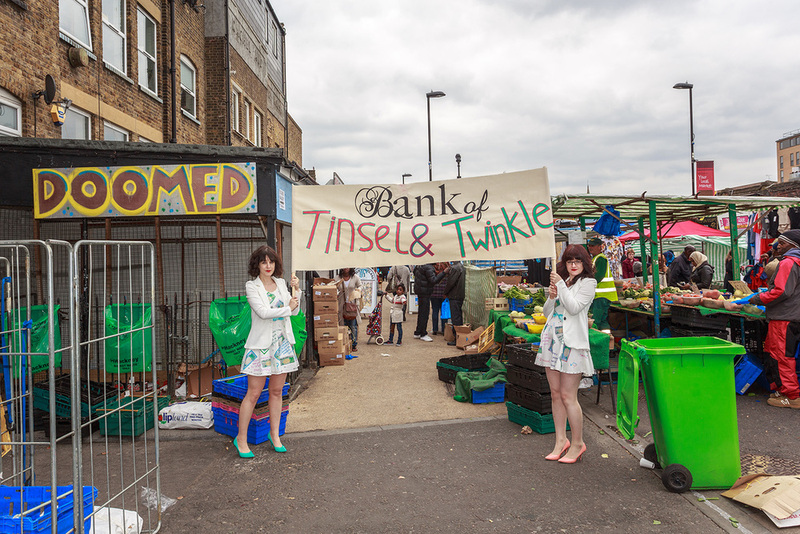 Tinsel & Twinkle created The Revolution Launderette for the London Art Car Boot Fair 2014. Dressed as 1950s inspired launderette ladies, they invited the public into their launderette and asked what kind of revolution people would like to see in the world. Surrounded by washing machines, Tinsel & Twinkle soap powder boxes and peg bags, their launderette is a symbol of change and renewal. Tinsel & Twinkle created the Clowns of Jestminster when they were feeling very glum about the Conservatives being elected in May 2015. For the Art Car Boot Fair 2015, Tinsel & Twinkle dressed as clowns, bringing their own surreal take on British politics to the public. People were invited to 'Feed Farage Foreign Food', 'Knock down the PolitiCANS' play on the T&T tombola and 'Hook a politician/duck'. Win a prize every time.